It’s estimated that one in three professionals on the planet are on LinkedIn. With that kind of reach, you can’t afford not to take LinkedIn seriously. Here are my top tips for improving your LinkedIn profile and strategy. Industry News: You attended an industry conference and gained some great insights. Share them. Insider Knowledge: You read a book and learned something others in your network could benefit from knowing. Post a summary. Inspirational: You saw a quote or heard a story that inspired you and you think it could inspire others. Personal: You’re working on a personal project. Sharing details about it is a great way to allow your network to get to know you outside of your job. Advice: You are looking for a specific type of connection. Do you need someone who has a particular area of expertise to help you achieve a goal? By posting about it, you prompt your connections to promote themselves or recommend others who would be a good fit. Bottom Line: Don’t just have a LinkedIn profile, actually use it. Right Now: Post an update. It ensures your name regularly appears in your connections’ news feeds so you stay relevant in their minds. It shows people who look at your profile that you are active on the site and interested in others’ work. When you interact with interesting content, a new section appears on your profile that shows your activity. Aim to be active regularly, so when people check out this section of your profile, they see recent updates. The point is to stay active so your connections grow accustomed to seeing that you’re always sharing new insights, and so when potential new connections see your profile, they see that you have a lot of knowledge and skills to offer beyond your job experiences. Right Now: Like at least three updates from your newsfeed. A lot of people make the mistake of thinking their LinkedIn profile is just a virtual place for them to display their resumes. It is in part, but it is also so much more than that. Beyond the summary and job experience sections that most people focus on filling out, there is also more than half a dozen other sections that showcase your interests and accomplishments in specific areas that are not featured with your job descriptions. It is estimated that only 50.5% of LinkedIn users take the time to fill out every section. This means that one half of LinkedIn users are failing to use the platform to its full potential. 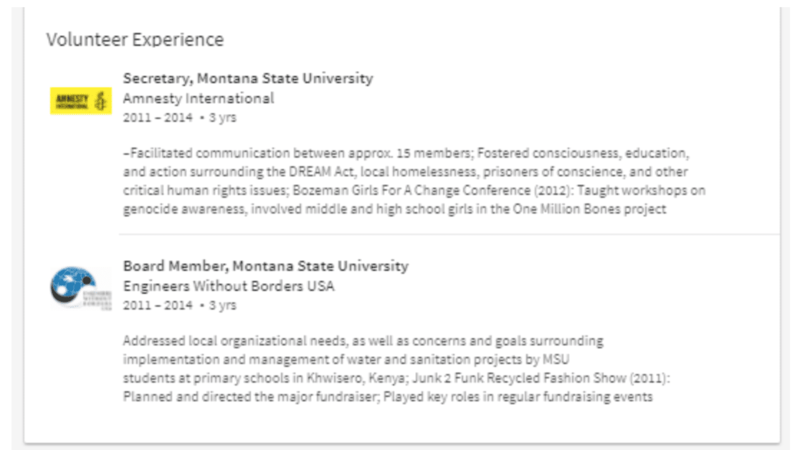 Here’s an example of an incomplete profile that illustrates why it is so important fill out every section of your profile with enough details to showcase who you are. If you were to scroll to look at the rest of this profile, all you would see is more jobs with similarly minimalist descriptions and a few job skills. 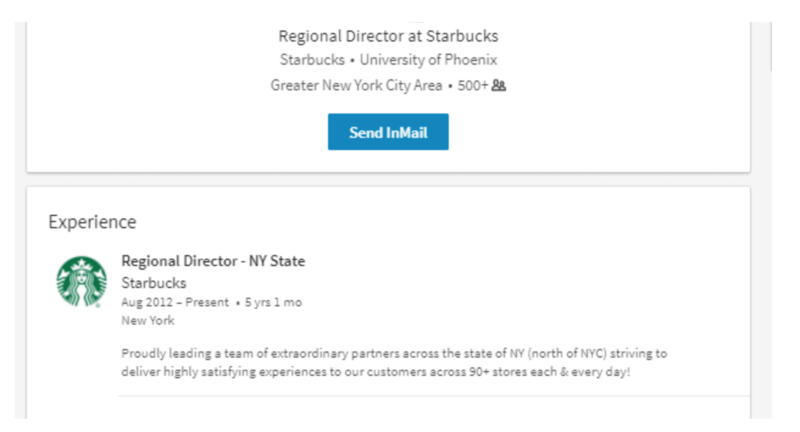 We know the person is a regional director at Starbucks, and are given a very vague idea of what that entails, but without a summary or any other sections filled out, we know nothing about who the person is and why we would want to connect with him. Remember, you are far more than your job title and you need to prove that on your LinkedIn profile. Fill out every single section option in your LinkedIn profile. If you think that you have no relevant accomplishments or activities beyond your job experiences, first reevaluate the personal projects you have worked on. Chances are, you demonstrated a valuable skill and/or relevant facet of your values that you can list on your profile. If you still struggle to come up with additions, this is your cue to get involved with more activities that can propel your career forward. Take a course that advances your skillset. We have a master communication course called People School if you want to increase your interpersonal intelligence. Volunteer with a local organization that supports your professional role or fulfills a personal passion. Join the board of a nonprofit that could use your professional expertise. Participate in competitions related to your personal and/or professional life. Even if you lose the first few, you’ll gain new skills and likely make valuable connections along the way. For example, if you’re an entrepreneur, enter business plan competitions; if you’re a programmer, participate in code challenges offered by platforms such as Codechef and Topcoder; or if you’re in marketing, enter competitions hosted by professional societies, such as the Society for Marketing and Professional Services. Regardless of your field, there are likely ways to earn recognition. Start by searching for competitions in your industry. Right Now: Complete all sections of your LinkedIn profile. If you’re struggling to come up with original words to spice up your profile, plug your current, buzzy ones into Thesaurus.com and choose replacements. It’s that easy. Pro tip: To the greatest extent possible, choose words that you would feel comfortable using to describe yourself verbally. Your vocabulary reveals a lot about your personality and communication style. You don’t want to confuse people by presenting yourself in different ways online versus in-person. Right Now: Replace these 10 buzzwords in your profile. Adders: Add to the knowledge of an update with an interesting anecdote, idea or example. They add gratitude with a thank you or a supportive response. Subtractors: Ignore good posts or take away from them by adding negative, unhelpful or unsupportive comments. Then I added him as a contact and he accepted! I added value and added a contact — win-win! Right Now: Add to someone’s post. One of the best parts of LinkedIn is adding connections — these can be people you met in real life, colleagues, or new contacts. How you request someone to connect on LinkedIn is incredibly important. Here are some best practices for adding people as connections. Always add a personal message! Tell the individual how you know them. Don’t send connection requests to people you don’t know or don’t have a strong reason to want to know you. If they decline your request for not knowing you, it will get marked as spam. After having a few of your requests marked as spam, LinkedIn will restrict you from trying to connect with more people. Give them a reason to want to connect with you. Some ways to do this include offering to help them, following up on something you spoke about in person and expressing your appreciation. Don’t wait too long! I used to have a stack of business cards from events and would connect with everyone at the end of the month. But this was too long! People didn’t always remember and it made me look like a procrastinator. Add people no more than 24 to 48 hours after you meet them. Import your email contacts selectively: I like adding your address book to LinkedIn but don’t add EVERYONE. This can be spammy and you might not even remember the people you are connecting with. Every few months I see if I have any new contacts from my address book to add and then send personal messages. Right Now: Selectively import contacts from your address book. According to the online marketing consulting and education firm, Quick Sprout, one of the most effective ways to yield a positive return for the time you spend on LinkedIn is to become active in relevant groups. When you want to build your reputation as an expert in a specific subject or need help from professionals in a particular niche, joining groups is often the best way to develop the relationships you are seeking. Unlike your overall network, groups are unified around defined interests, which both gives you access to professionals who have the qualities you are looking for, and allows you to dive into meaningful conversation. Read their guidelines. Some groups have restrictions on the topics and types of content they allow. Skim the most popular discussions to gain an understanding of what topics spark the most active conversations. Observe the dominant communication style. Are posts and comments formal and full of jargon? Do people write casually, as if corresponding between friends, or something in-between? Match that style. Do not join a group with the sole intention of promoting yourself. Yes, you’ll want to yield value from the group, but you must offer value and become a respected member before people want to do you favors. Online marketing expert Neil Patel recommends that when you first join a group you should begin interacting by answering questions. This is a more subtle way of establishing yourself than immediately posting and shows that you’re interested in other people and helping them. Once you’ve participated in a few conversations, then when you start one of your own, members will be more willing to engage because you are not a stranger coming in imposing your ideas/requests. After you’ve engaged in a couple discussions and offered value to the group, reach out to the members you’ve connected with most to start building individual relationships. Search the full list on LinkedIn to find your community. Right Now: Join a group and answer 3 questions! 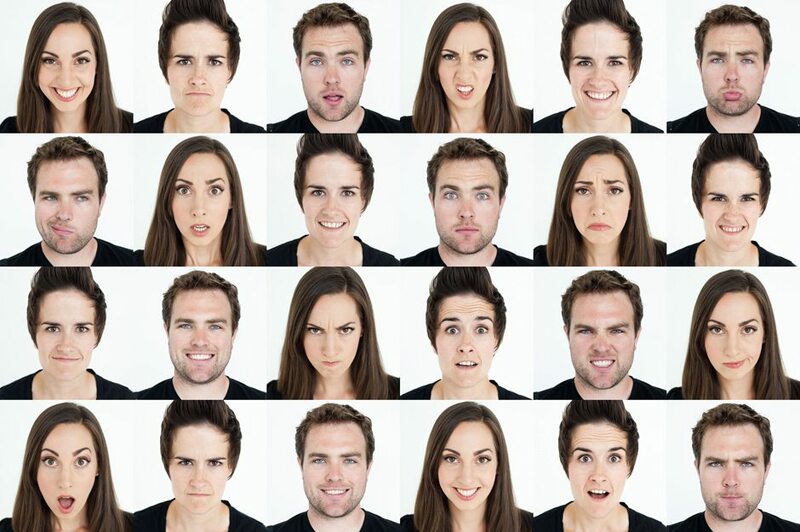 If you’re like me, you have a really hard time picking the perfect profile picture. The thing is, this is not a silly worry. Our profile picture says A LOT about us. According to research published in the journal Psychological Science, slight variations in how an individual face is viewed can lead people to develop significantly different first impressions of that individual. While no one can change their face, we do have control over what the photo represents and how we want it to be perceived. Upload your photo at PhotoFeeler. Want some extra tips on picking? We used the photos from PhotoFeeler to do a big study. For example, researcher Farhod Karimov from the University of Brussels found that when people have their picture taken from below, they are seen as more self-confident, sociable, and attractive. This comes from our childhood spent literally looking up to adults we admired. If you want people to think you are more trustworthy, open-minded and sympathetic, take your photo straight-on. Facing the camera conveys the body language signal, fronting, which is when you face your entire body toward someone to show that you respect them and are fully engaged in your interaction. Check out all of our profile tips. There is nothing better than crafting the perfect LinkedIn status update and having people like and SHARE it with their audience. It is the ultimate show of support! When you share other people’s posts you get great social capital. In addition to showing your interests and increasing your activity level, this is a great way to show people that you are thinking about them without having to personally reach out. 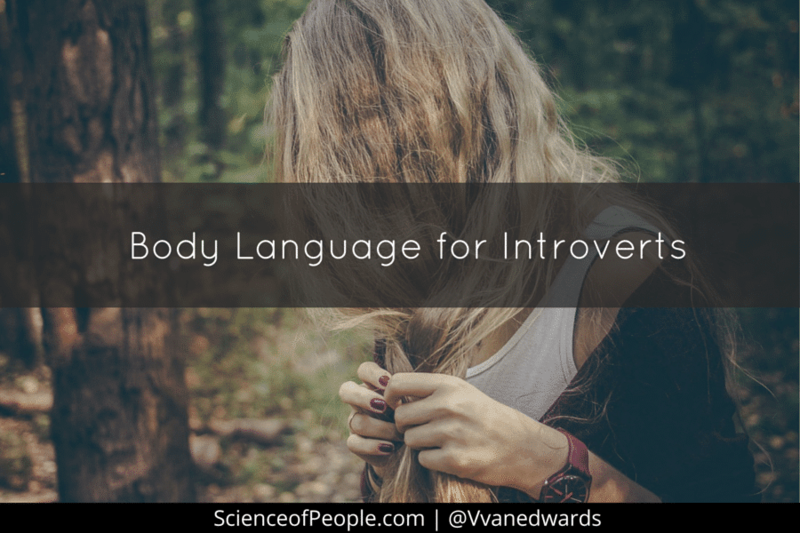 For example, RB Kelly is one of our certified Science of People Body Language trainers. 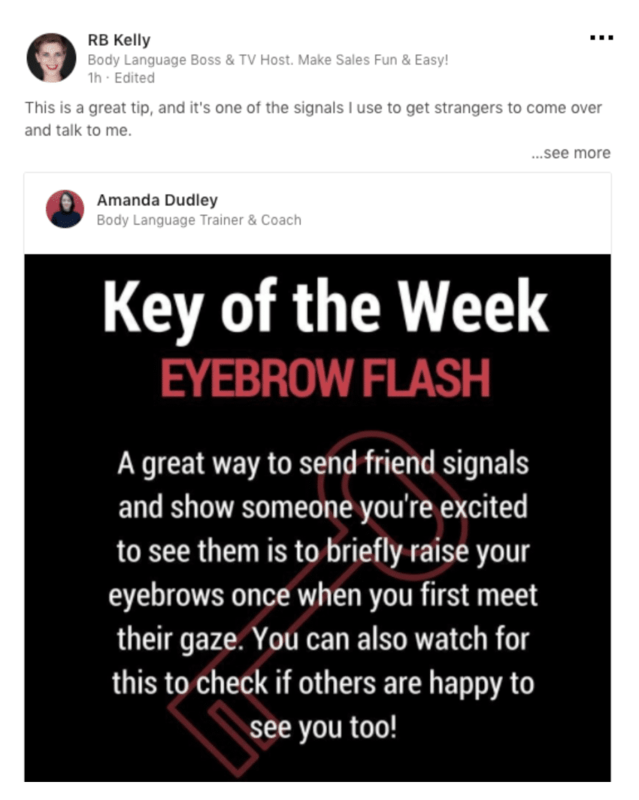 She shared one of her fellow trainer’s status updates because she knew it would be relevant to her audience as well. Win-Win-Win! Want more interesting tips? 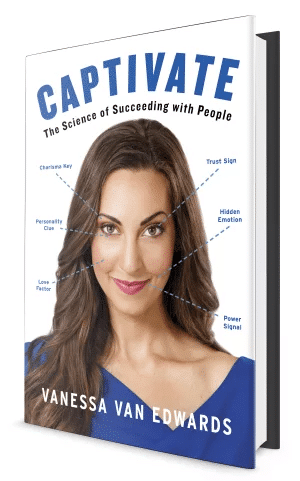 Check out my latest book, Captivate. Now that you’re on your way to perfecting your digital brand, I want to show you how to succeed with people–your boss, your colleagues, your friends and family. This is the first comprehensive, science backed, real life manual on human behavior and a completely new approach to building connections. Posts featuring statistics and links to articles for more information receive a 37% higher click-through rate than those that don’t feature statistics. Individuals who crafted posts that were 150 characters or fewer (often with an accompanying link) received an 18% increase in engagement rate. Word choice can have dramatic effects on how your post is perceived. LinkedIn’s research found vast variations in engagement rates between posts that were identical, with the exception of one or two keywords. While there is no magic formula to choose the right keywords, you carefully should consider the connotations of your words to make sure they appeal to your target audience. The easiest way to do this is to mimic the jargon that your target audience uses to describe themselves and what they do. If you write articles, tell your audience exactly what they’re getting. People don’t want to waste time by clicking on an article, getting a few paragraphs in, and realizing that it is not relevant to them. The answer determines whether something is worth sharing. Right Now: Punch up your posts. Make them catchy or delete them. If you’re climbing your industry’s ladder, you need to prove to your peers and superiors that you are the right fit for advanced opportunities. If you’re a freelancer, your target audience is not other freelancers — it’s the clients you hope to gain. If you are looking to switch industries, be on top of everything happening in the industry you want to transition to, share what you learn, and contribute to online discussions about the industry to prove that you would be an asset to a company in that space. Also, remove current career jargon from your profile that will confuse recruiters in the industry you are transitioning to, and tailor your descriptions to match the needs of your ideal job. 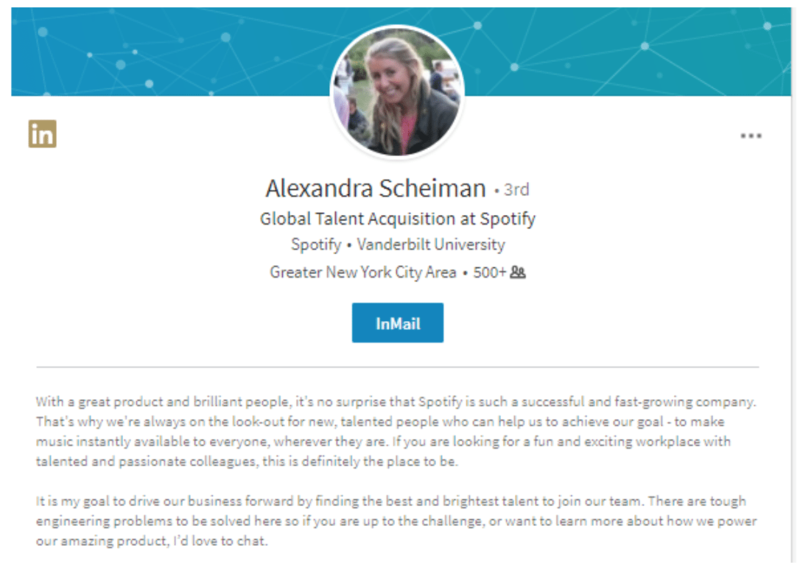 As a recruiter, Alexandra’s networking priority is making connections with potential job candidates. By describing the type of candidates she is looking for, and directly stating that she would love to chat with people who fit the bill, she encourages her ideal prospects to reach out to her. 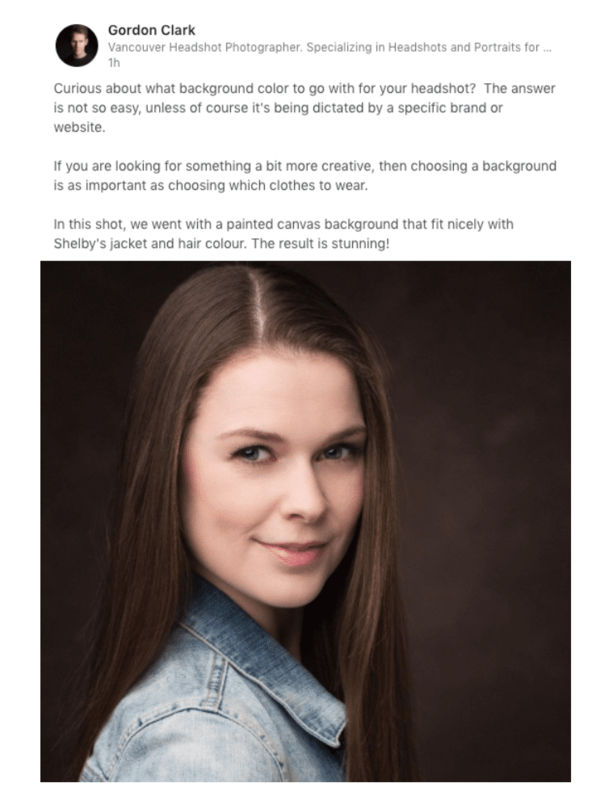 This saves time by reducing the amount of effort she has to invest in identifying people to connect with, and deters people who do not fit her targeted demographic from trying to take up her time for unsolicited purposes. Insider Tip: If you want people to reach out to you, make sure your profile includes your preferred contact information. By default, you likely have your email displayed, but if your inbox consistently is overloaded, and social media is a more effective way to get in touch with you, mention that. Right Now: Tailor your profile for your people and consider adding contact info. According to LinkedIn, more than sixty percent of users are interested in posts about industry insights. Whether you set aside time to do research and create original posts, or you opt to share the posts of industry experts, updating your connections about your industry, rather than your career, is an effective way to increase your influence. Doing so proves you are up-to-date in your industry (in other words, you’re someone who is well-informed and would be great to work with) and it allows you to provide value to your connections, who then will associate you with the benefits they gain from the knowledge you share. Write “How” and list posts (like this one!). These types of articles directly convey the value that readers are going to get from them and outperform other types. Provide in-depth insights about your subject. Readers on LinkedIn appreciate content that teaches them valuable information for their careers and that requires length. The most successful posts are between 1,900-2,000 words. Include images. Articles with eight images received the highest average number of views. Reign in your passion. While you may have strong feelings regarding an industry event that you’re analyzing, it is best to keep your emotions to yourself. Content with a neutral tone outperforms pieces with a positive or negative one. Focusing on the facts and objective analysis will build your reputation as a competent professional and prevent you from alienating peers with different opinions. Change the title and subheadings. Edit the intro sentences to various paragraphs. Add/remove a few hundred words from the length of the article. Any combination of these actions will alter your content enough to appear original to readers who aren’t fanatics. If you don’t have a website but want to write a blog, LinkedIn is a great place to start. Simply write and publish articles as you would if you had a website and pay attention to the feedback people give you so you can improve. To give your content greater reach, also share it on your other social media platforms. Right Now: Write one article for your industry. LinkedIn Tip #13: Don’t Give, Don’t Take; Match! A study published in the International Journal of Social Media and Interactive Learning Environments found that individuals report gaining the most value from LinkedIn when they focus on sharing professional resources, not directly on building themselves up. The reason for this stems from the desire that most people have to foster reciprocal relationships. Organizational psychology researcher Adam Grant studied more than 30,000 professionals across multiple industries and found the majority of people have a sharing mentality; they are willing to offer value to others with the expectation that other people will offer value in return. There are also people at both extremes: givers who constantly go out of their way to help others without asking for anything in return, and takers who relentlessly pursue their goals without regard for the people they use along the way. Grant found that people in both of those groups tend to be less successful than the people who strive for fairness, otherwise known as matchers. Givers fail because they focus so much on other people that they run out of time and energy to improve their own careers. If this sounds like you, keep in mind that people expect you occasionally to ask for help and do some self-promotion. It doesn’t make you a burden on others. Takers fail because matchers turn against them. They do not like people who constantly ask for help and promote their own self-interests without taking time also to support others. On LinkedIn, this dislike translates into people refusing to engage with takers both online and offline. Be the bridge between people. If you have two or more connections who are looking for people like each other, introduce them. Endorse the people you’ve had successful working relationships with. Do more than click to endorse your connections’ skills. Take a few minutes to write a sincere testimonial about their abilities and character. Share your insights. If you’re an expert on a particular topic, share information that is relevant to your overall network and respond to questions related to it. Right Now: Introduce two people who you think should know each other. You could have a flawless LinkedIn profile with every section filled out with standout accomplishments, five hundred-plus connections, and dozens of skill endorsements, but it all will mean little if you don’t keep in touch with your connections. The biggest mistake people make on LinkedIn: You meet someone in real life, connect with them on LinkedIn, and then a year later expect them to help you get a job at their company when you suddenly find yourself looking for new work. So, you want to keep in touch with everyone, but if you have hundreds of connections, trying to keep in touch with everyone can seem like a daunting task. However, you only need to keep in touch with professional connections once every month or two to stay relevant in their minds, which you can do in just a few minutes a day. Congratulate people on promotions and when their company is featured in the news for something positive. The easiest way to do this is to check your LinkedIn notifications to see who has found new work or been promoted recently and set up Google alerts to hear news about the companies your connections work for. When you travel, let people know you are in their city and invite them out for coffee. This is a great way to get face time with contacts you otherwise might go months, if not years, without seeing again in person. Be a professional matchmaker! Introduce people to someone new. Once a month, look at your LinkedIn contacts and status updates and see if you can make any connections. Pass along helpful information. This could be content, new job opportunities, networking events, etc. Posting this information for your entire network to see is great. However, not everyone checks LinkedIn regularly. 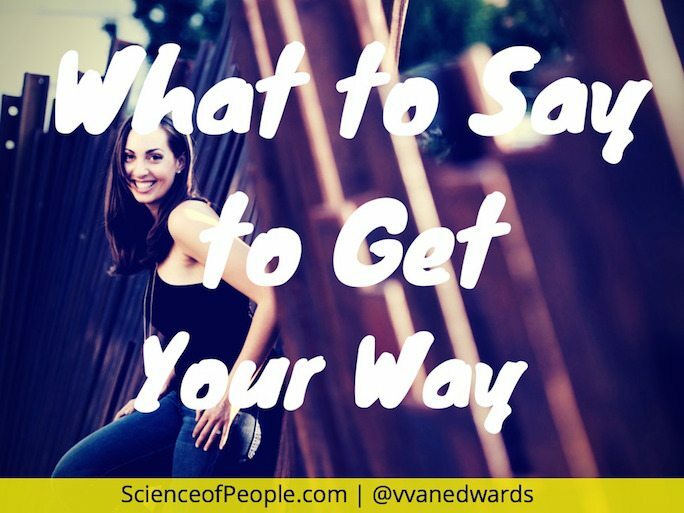 Whenever you come across information that would be particularly helpful to a connection you want to form a stronger relationship with, email it to them personally to show that you want to help them become more successful. 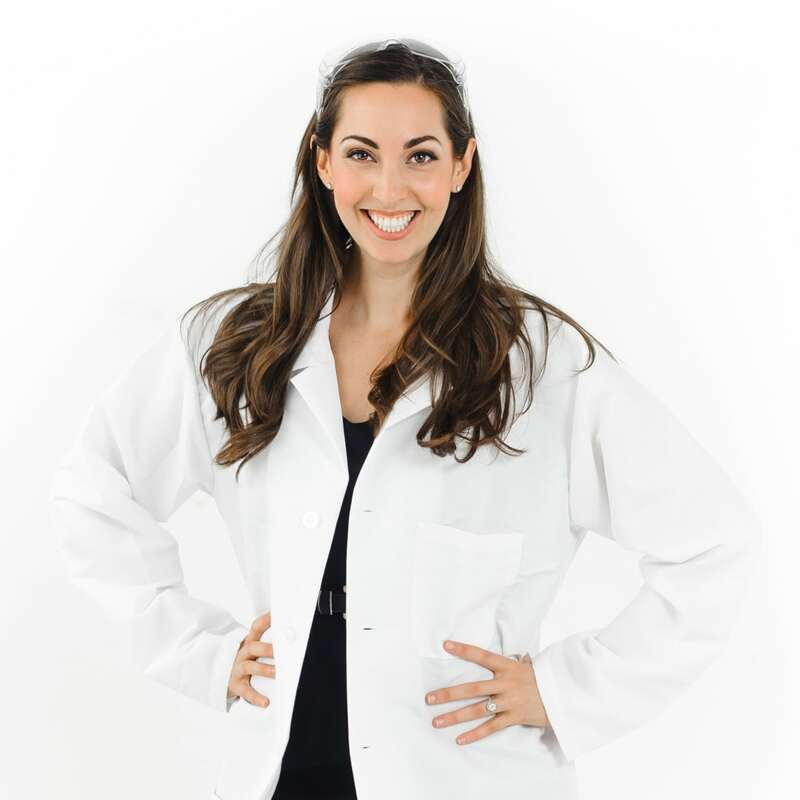 Want to learn more of my networking strategies? I have an entire guide for networking here. I was shocked to see this! I never know what kind of profiles people are looking at compared to mine, but I was pleasantly surprised with this list. This info is extremely useful if you know how to leverage it. Who does LinkedIn think is related to you? 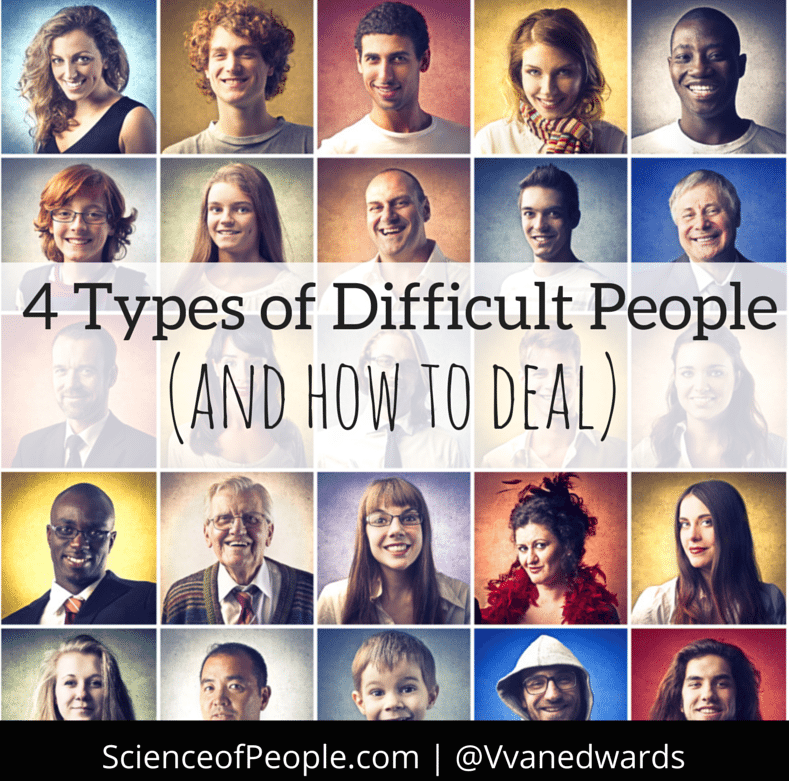 Are you being paired with people in your similar industry? With your similar title? Do you like who you are being paired with? 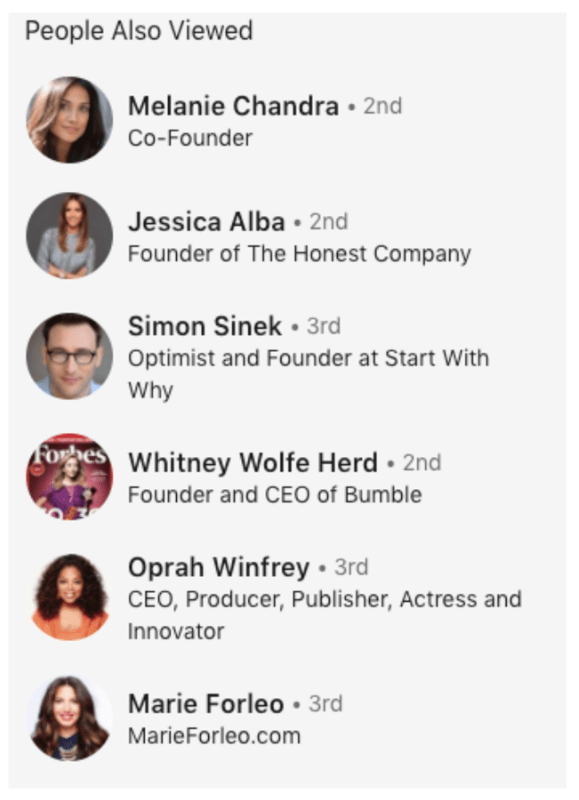 You can get an idea of who LinkedIn thinks you are by who they pair you with, and then either leverage it or change it. For example, if you sell software and notice you are being paired with a lot of people in software, this might be good or bad. Would you prefer sales? Or tech? You can change wording in your profile and your contacts to better fit your goal. Can you connect? If they are coming up in your related search, you likely are coming up in theirs. Can you connect with them? 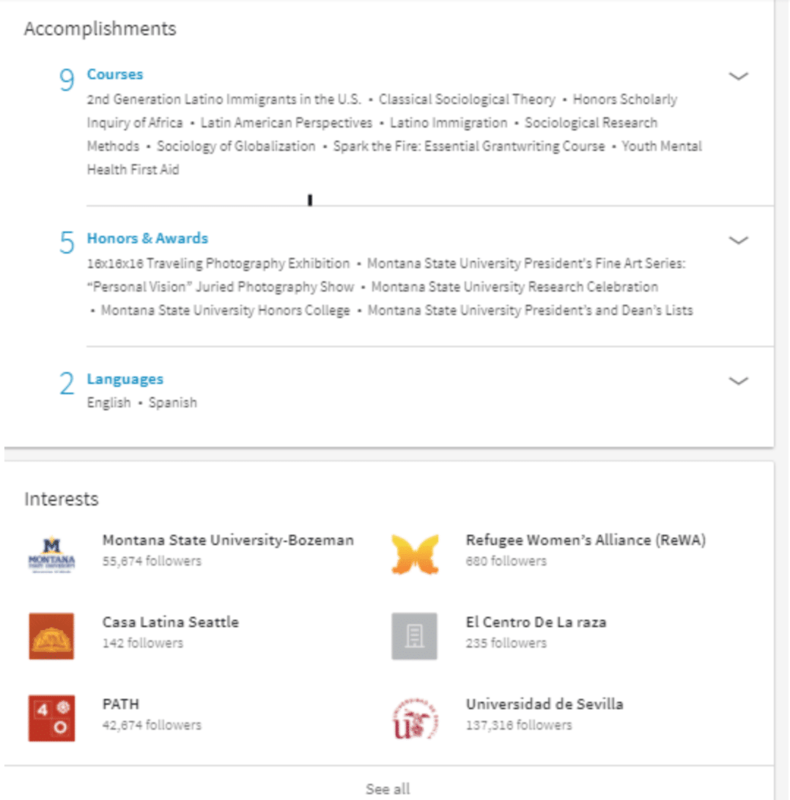 I have reached out to big VIPS who come up in my related search and said, “I saw you came up in my People Also Viewed section of LinkedIn today and thought we should connect since we seem to be in similar circles.” It’s a great motivation to connect. Who is looking? You also might be able to make some guesstimations regarding who is viewing your profile on a given day. For example, I do a lot of spokesperson work and had a sneaking suspicion that was changing my “People Also Viewed” section. Sure enough, my manager got an email today from a company wanting to do a spokesperson deal. My guess is her and her media agency were looking around. I also guess that they also are considering Whitney Wolfe Herd, Marie Forleo, and Melanie Chandra for the deal. Now I know who else is in the running! Right Now: See who you are paired with and take action! Like at least three updates from your newsfeed. Complete all sections of your LinkedIn profile. Replace these 10 buzzwords in your profile. Selectively import contacts from your address book. Join a group and answer 3 questions! Punch up your posts. Make them catchy or delete them. Tailor your profile for your people and consider adding contact info. Write one article for your industry. Introduce two people who you think should know each other. See who you are paired with and take action! Start right now to boost your LinkedIn network and supercharge your profile. Small steps matter.